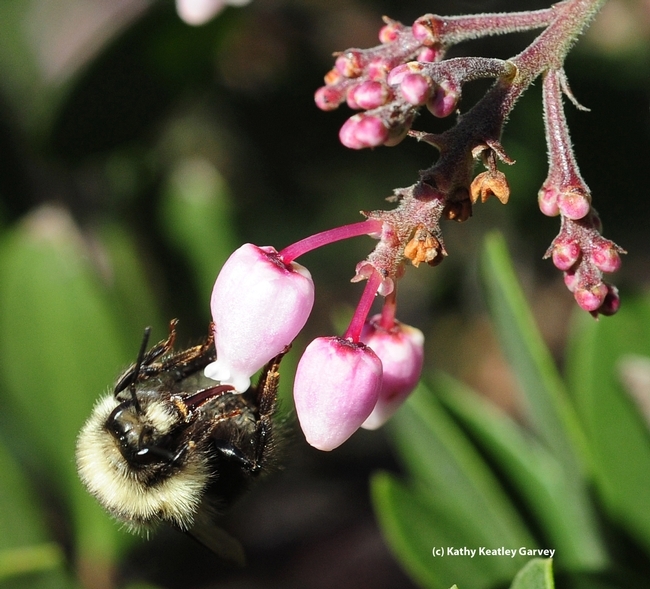 It was the first day of 2013 and what did we see: a queen bumble bee, Bombus melanopygus, aka black-tailed bumble bee. Like scores of others, we decided to take a walk on Jan. 1 in the Benicia State Recreation Area. Located in Solano County, just outside the city of Benicia, the 447-acre park on State Park Road offers a view of the Carquinez Strait amid lush grasslands, rocky beaches and a marsh filled with cattails about to lose their charm as they go to seed. It's a good place to walk, run, cycle, and engage in picnicking, fishing, and bird watching. 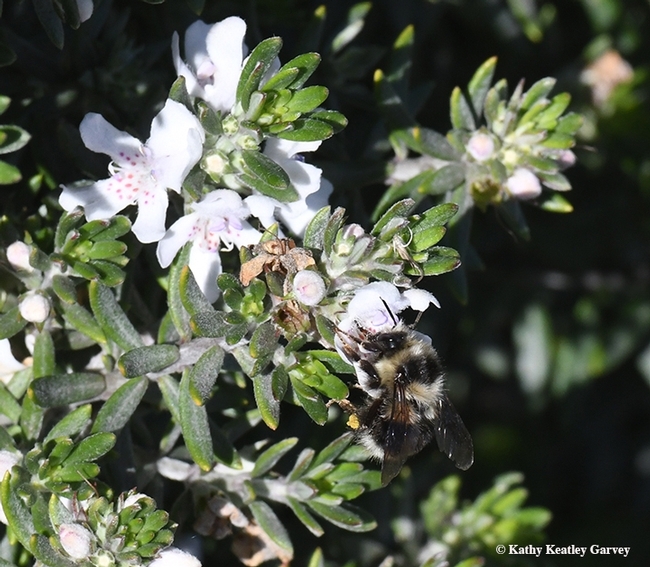 When the temperature hits 55 degrees, it's common to see honey bees foraging among eucalyptus, manzanita and wild mustard this time of year. In mid-morning, Jan. 1, the temperature registered 50 degrees. No honey bees did we see. But as we stopped to admire the manzanita in the native plant garden, we spotted her: a black-tailed queen bumble bee, as later identified by native pollinator specialist Robbin Thorp, emeritus professor, UC Davis Department of Department. 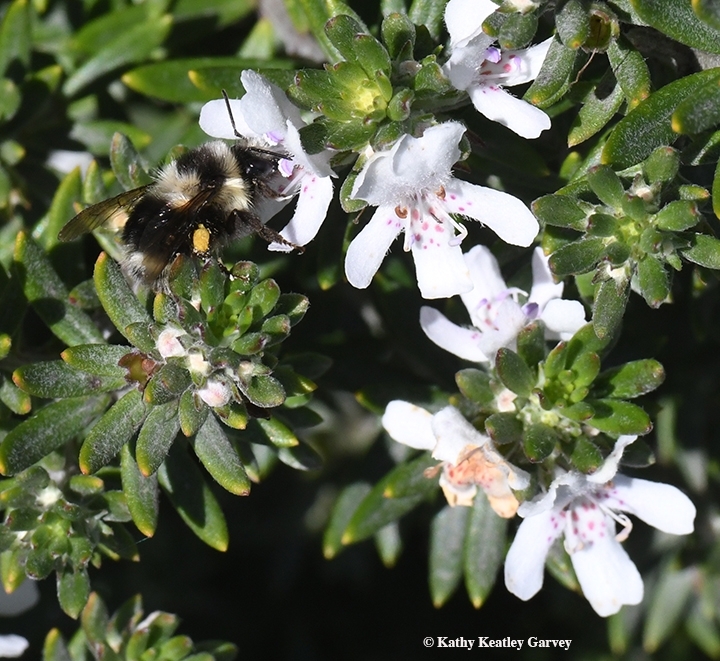 "Yes, a queen of Bombus melanopygus, earliest of our bumble bees to emerge from hibernation and start nests each year," Thorp said. "I had heard that some were flying in December in the Bay Area. Keep an eye out for the first workers or first queens with pollen loads. Those will be the signs that nests have been established. Otherwise, seeing queens out on a nice sunny warm day, even sipping nectar, may mean that they are just stretching their wings and checking things out between naps, before getting down to the serious business of starting a new nest." 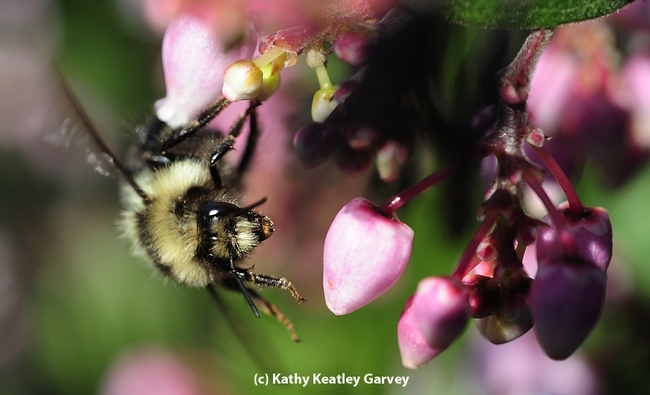 This species of bumble bee is native to western North America and is found from California to British Columbia and as far east as Idaho. "In the southern part of its range, the third and fourth segments of the abdomen are black instead of the red color seen in the northern populations, and this black color form was formerly known by the name Bombus edwardsii," according to Wikipedia. Soon we saw that we were not alone. 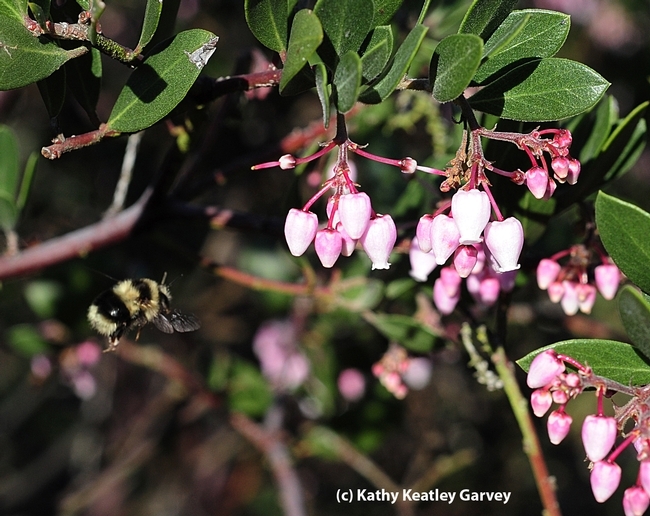 Several other queen bumble bees quietly appeared, all to sip the sweet nectar of manzanita on the first day of 2013. Soon we expect to see them with a load of pollen.